Insta-Nerve® Insta-Nerve® is a patented non-invasive, passive measuring device using the principles of nerve conductivity for the diagnosis of Carpal Tunnel Syndrome. This compact instrument uses state-of-the-art technology to perform a test simply and accurately in under 2 minutes. Insta-Nerve® is affordably priced and gives test results comparable with the standards of current diagnostic machines, without requiring the assistance of a technician or laboratory interpretation of data. Insta-Nerve® produces quantitative analysis which are important for the early detection of developing compression neuropathy and repetitive motion injury. 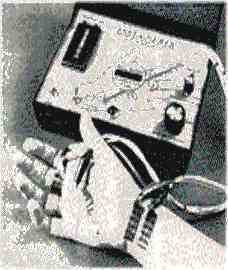 Easy to use, the disposable electrodes are placed on the finger, palm and wrist according to the diagram presented on the panel of the monitor. The minimum stimulus power of this user and patient friendly device assures a safe, pain free diagnosis. The manual which comes with the device contains diagnostic tables and short easy to follow operating instructions. The Insta-Nerve® is handsomely packaged and its ultra compact and light weight design can easily fit into a briefcase. It uses a standard 9 volt battery and can be used anywhere, any time. Call for pricing and details. 1-800-463-5470.